If you are searching for an efficient digital marketing agency to do SEO for your local business in Kingston Upon Thames, you have arrived to the best place because ranking websites is our passion. By using only ethical, well tested and up-to-date techniques to improve rankings, ChelseaSEO helps local contractors and small businesses to be more popular on the internet. We are ready to enhance your website, and give it the required attention by dominating the search engine ranking pages. No matter if you are a construction company in Canbury, a curtain store in New Malden, a guest house in Surbiton or provide professional services to locals of Kingston Upon Thames, our reliable marketing packages are just made for you. Today, Google gives more attention to local businesses, so the time has come to act as people near you are constantly searching for your products and services! According to the council, there are more than 173.000 potential consumers live in the Royal Borough of Kingston Upon Thames. Local stores, restaurants, and contractors are always in need. However if your website isn’t showing among the top results or in the map area when someone searches, you lose these people. Does your website show up in Google’s first page when you search for your products or services? It should, our London SEO company is the best decision to make that happen! If you are looking for instant result, choose Pay-Per-Click by Google Adwords or Bing Ads. Start your campaign, enjoy new visitors and pay for their clicks. It seems easy – but is it really? You have to choose the best converting keywords, optimise and monitor the campaign to get a positive return of investment. Our skilled PPC team can guide you through the process. Search Engine Optimisation is another popular option you can go with. SEO is a long term strategy, your website won’t rank high overnight, but when it has reached a top position, visitors are coming frequently and you don’t need to pay for their clicks, just enjoy the constant traffic you receive every month. In the long term PPC could be quite expensive, if your niche is competitive. If you want to invest in your company’s future, the most recommended option always be SEO, however you have to give time to get the best results. Depends on your competitors and the chosen keywords’ difficulty, it could take months to see improvements on visitor numbers and rankings. For the best results combine PPC and SEO. What is Local SEO in Kingston Upon Thames? SEO includes on-site modifications and off-site techniques to reach top positions in Google which is the most used search engine in the UK since ages. 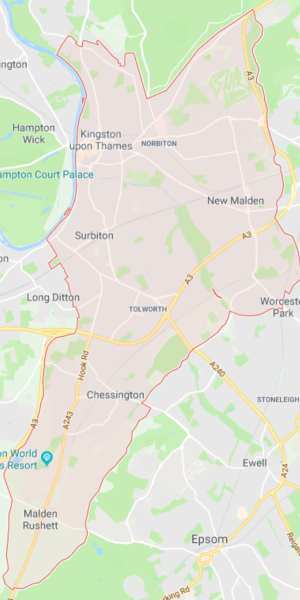 Local SEO is exactly the same, but instead of a large city or country it’s focusing to a smaller area like the Borough of Kingston Upon Thames or it’s districts such as Tolworth, Norbiton, Coombe, Canbury, Berrylands, New Malden, etc. Local SEO is important for small businesses as according to statistics at the present days more than 84% of consumers conduct local searches. For example, if you are a local laundry service, ideally when people search for “laundry services near me” find your website. Taking advantage of SEO will improve your visitor numbers that you can easily convert to more customers. Our experienced team will work hard on your website to raise it’s organic traffic for more sales or qualified leads. There is no easy method when doing SEO, each business is different and every industry has its own goals. Whether you are an interior designer, a lawyer, or a personal trainer in Kingston Upon Thames, we can help you to enhance your online presence and attract new clients. We won’t stop after we have achieved top listings in Google, we work hard on the other search engines including Bing and Yahoo too. You might ask this question: Why do I need a SEO agency? Well, search engine optimisation could be difficult, especially if you don’t have premium tools, experience and knowledge – you can’t effectively work on it. That’s how our team can help you! There is a need of a smart plan for any business who wants to attract new customers and be successful online. At the beginning we are focusing on Google’s “local map pack”, because having one of these listings will get your business increased visitor numbers and more trust. Meantime we will work on your target keywords to get their organic listing. 1. Getting more information about your company, niche, audience, your products or services, etc. 2. Technical website audit (on-site/off-site) or we develop a WordPress site in case of your business is new. 3. Website checking, error fixing, optimising including improving user experience, locally optimised title tags, mobile friendly test, duplicate content check, unique meta descriptions, header tags, SEO friendly urls, sitemap creation, image size reduction, image ALT tags, etc. 4. Any amazing plan must include keyword research. We gather keywords with enough search volume, low competition rate and which are related to your niche. At the beginning we focus to your borough, as in a competitive market such as the UK, your keywords might take at least nine or more months show up on the first pages of Google. 5. As the speed factor is already included in Google’s ranking algorithm, we are working on the performance for better user experience. Nobody likes slow website, if yours is too slow, visitors might leave and won’t come back. 6. Studying your competitors: their strategy, how and what they do, update frequency, content type, citations, backlinks, social media, and more to improve our plan. 7. Your visitors as well as Google like frequent updates and content, so with the help of our team, we make unique, relevant and insightful articles about your business. 8. Using Google Search Console and Analytics on your website for analysing the incoming traffic and setting up keyword tracking too for reports . 9. Setting up Schema Markup for search engines, so they can display useful information on their result pages. 10. Registering new and optimising your existing citations like Google My Business, Bing Places, Yelp, Thomson Local, Yellow Pages, Trade Pages, Bizify, Hot Frog, etc. 12. Taking advantage of social media for influence and positive results. Updating your profiles and creating posts, or register new ones on Facebook, Instagram, Twitter, etc. ChelseaSEO, your ultimate marketing agency is ready to boost your website’s rank higher on Google. Our services will bring more traffic, sales and leads to your online business. It doesn’t matter if you own a footwear store, a minbus hire service or a dental salon, together we can reach your dreams! Take advantage of our latest SEO packages, and let’s start today!